The early Newark Bears are remembered as the greatest minor league team in the history of baseball. Their reign began when millionaire beer baron Jacob Ruppert, owner of the New York Yankees, purchased the team from the newspaper publisher Paul Block in 1931. The first five seasons under Ruppert saw the building of a farm system that eventually produced the great Yankee dynasty. The Bears' finest hour, however, came in 1937 with a team that many experts consider the single greatest in the history of the minor leagues. In 1937, the New York Yankees’ top farm team obliterated the International League in an overwhelming season-long performance. Utilizing a lineup that many said could have competed successfully in the major leagues, the Newark Bears beat the rest of the field by a record 25 1/2 games margin. Capping the season, the team mounted a singular comeback against overwhelming odds in the Junior World Series. Presented here is the 3" travel clock that was presented to no less than Bears owner Jacob Ruppert himself. 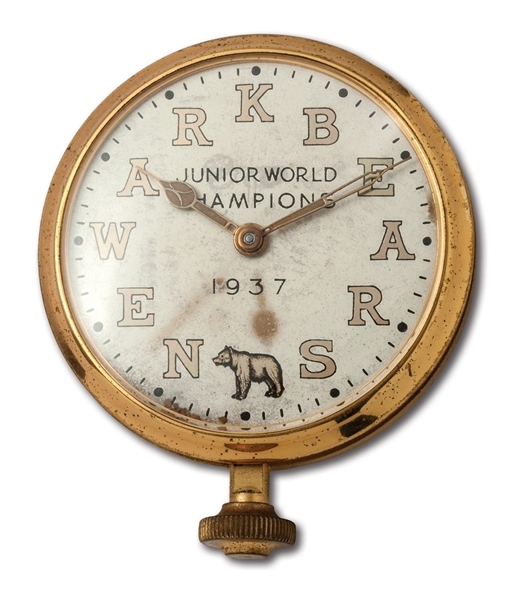 The face is emblazoned with the Newark Bears team logo and "Newark Bears" in gold block lettering around the perimeter. In black print in the center is "Junior World Champions, 1937." 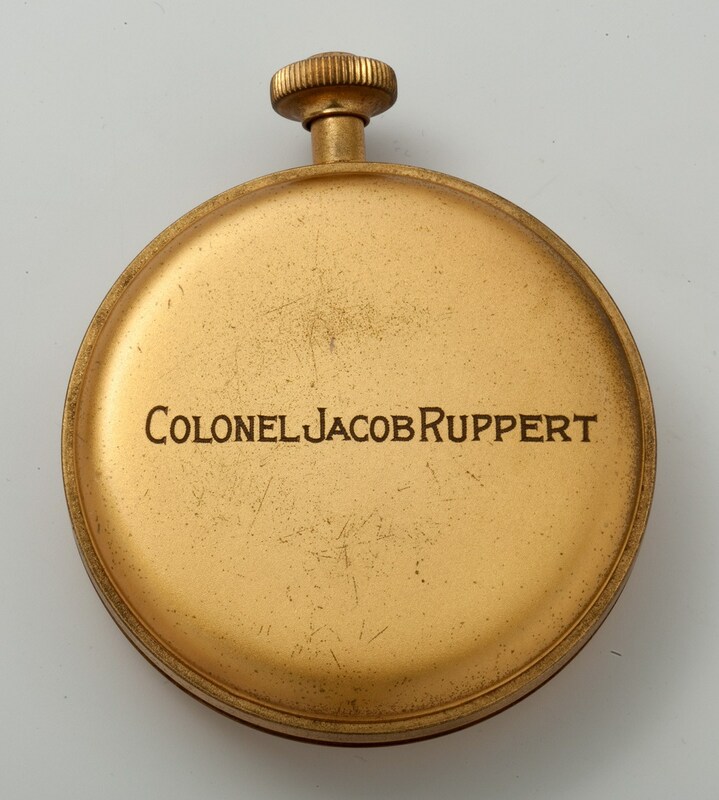 "Colonel Jacob Ruppert" is engraved onto the back. The clock, Which has the appearance of an oversized pocket watch, is in Excellent condition except for some minor tarnishing. Originates from the fame Barry Halper Collection.